Based in Montreal, Canada, Crew Collective is a truly stylish coworking space and cafe. Could it inspire your office design? Situated on the ground floor of 360 St. Jacques in Montreal, Crew Collective is a unique coworking space and cafe that fully embraces its building’s lavish historic roots. Admittedly, when it comes to palatial architecture, Crew Collective has plenty to work with. This opulent building was originally the Royal Bank of Canada’s headquarters, built in 1928 – meaning the setting is already grandiose. In fact, there are plenty of features here that would also look at home in Hogwarts. Between tall arched columns, for example, large windows let in plenty of natural daylight, while a wide staircase with golden bannisters ascends to the space’s entrance. And visitors tend to get a nice view whether they look up or down; with the smooth floors and high ceilings both boasting old-world designs. Not to mention that from these ceilings hang warming chandelier-style lights. But there’s also plenty to suggest that this is a modern space, too. While meeting rooms are cordoned off by gold (yes, gold) walls, they are also fronted by sleek glass doors and sit atop modern flooring. Many of the chairs to be found here are plush, and desks are topped by a grainy wood, but they’re also clean, sleek and undeniably 21st century in design. The effect is a harmonious combination of grandeur and stylish modernity, resulting in a workspace that truly fits the definition of deluxe. 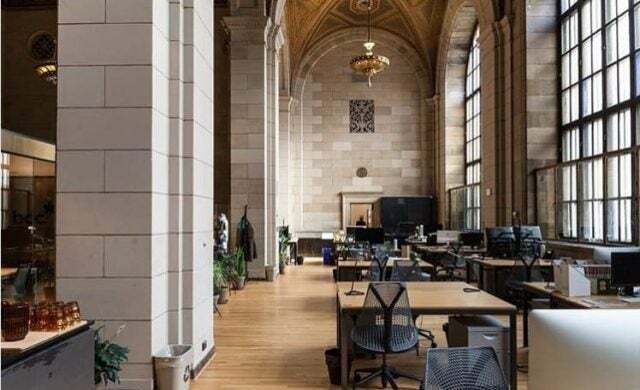 At Crew Collective – or, in fact, at any office that looks like the interior of a castle – a flavour of luxury can work to instill a sense of pride in workers. Subconsciously, one might believe that if he or she is given such a grand space to work in, it must be because their work, their role, and the overall ambitions of the company are important. While employee pride may not seem as business critical as, say, employee productivity, it’s actually been proven as a contributor to success. In a US survey carried out by Robert Half, for example, taking pride in work – and in working for a particular company – was found to be the strongest driver of employee happiness. And employee happiness, as we know, leads to increased productivity, more creativity and less absenteeism. Furthermore, it’s a reasonable assumption for employees to make that, if company superiors are keen to invest in and maintain such an opulent space for them to work in, they must think highly of their employees – and making such an impression can go a long way when it comes to motivating staff to work hard and stay loyal to the business. Obviously, we can’t all be based in the old HQ of a royal bank. But what we can learn from Crew Collective is that office design doesn’t have to be understated and wholly modern; and it can embrace its building’s history and architectural qualities. To start with, you might decide to research into the history of your building. Was it once a factory that produced a particular type of product? Did it once house an unusual organisation? It may be that you can base your office design around whatever theme you find, with the aim of putting an elegant spin on the building’s history. Take a look at your flooring, too – is it hardwood that could be given new life with a paint and a polish, or concrete that might look better overlaid with smooth, elegantly patterned tiles? You might even take inspiration from Crew Collective’s golden walls by touching up some aspects of your decor with gold spray paint. But be careful to do this minimally – some desk legs here, a lamp there – unless, of course, you want your office to look like Trump Tower.